Here’s a somewhat long post to savor before we set off to start the GHT. As you read this, we are on a two day transition of a plane and then a 12hr jeep ride that will get us to the eastern start of the GHT. I do not know that I will have service to post again for 3-4wks, just one of the many adjustments to hiking out here in remote parts of a third world country. I do have the GHT map embedded on my “Where’s Wired” tab. Don’t be worried if we don’t move for a day. There will be some days for acclimatizing, as we will go over 15,000ft/4,572m a couple times in that leg. Again, I love this chart and how you can hover over the elevation chart to see the elevation where we are. Some of you may have just caught that I said when I’m HOME in July. Yes, you read that correctly. I’ve recently decided to change my plans for this summer. I had been thinking of Europe in July and August, but nothing was strongly pulling me. Knowing that the GHT is expected to take a strong toll on my body and mind, I wanted to leave Europe loose. Well, with nothing strongly grabbing me, I do have a family event in Chicago in early July I hope to make, and then an option back home in Oregon the rest of July that does interest me. One of my friends has the month of July off, and is doing a relaxed summer road trip in the Pacific Northwest. Since I thru-hike, I’ve have had little opportunity to explore my home area in the summer. My mood this past year has just been more to nest and be near home. I’ve been trying to pay attention to that rather than habitually feel the obligation to travel and hike. The road trip option is calling me, and I like to go with my gut on things rather than do something just because it’s what others might expect me to do. Last year, when I did more of a road trip experience in Tasmania with Griggs, I really enjoyed that feeling after many months of thru-hiking. I’ll see how I feel about August. There’s a part of me that thinks I might like a solo hike at that point once I’ve been able to recoup from the GHT and catch up on the blog. For some reason, the Colorado Trail has entered my mind as an option for that. We’ll see. There’s something nice about having an open plan and just seeing how things go. For now, I’m focused on the GHT. Now, back to our Kathmandu arrival and logistics. I have to say that I was quite happy that Griggs and I were on the same flight to Kathmandu. 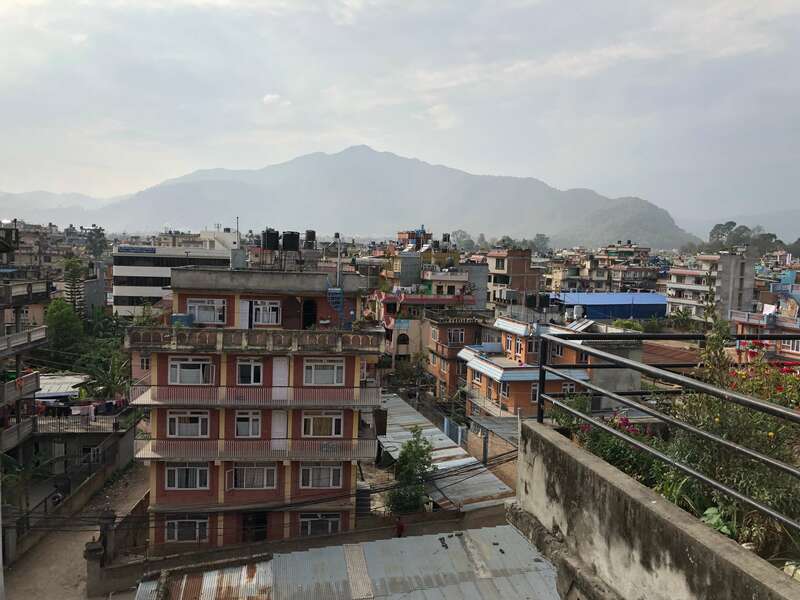 Griggs has been to Nepal before, and I was apprehensive about arriving solo having heard how hectic it can be. It was nice to be with someone that knows how arrival and the transition to town goes. We had a bit of a layover in the Doha Airport in Qatar. As we checked in for the last leg to Kathmandu, the airline was randomly selecting carry-on luggage to be moved to check baggage in anticipation of being too full. I made it through, but Griggs had to check his pack. I can’t even tell you how frightening it is to let your pack out of your sight. I was anxious for him. 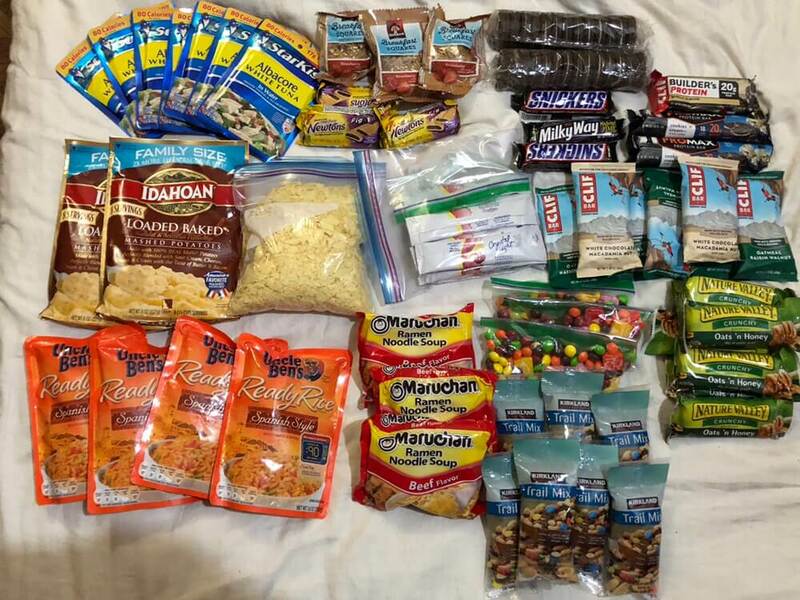 We each had two bags full of food for resupplies and some gear we couldn’t carry onto the plane. Just worrying about that was enough for me. 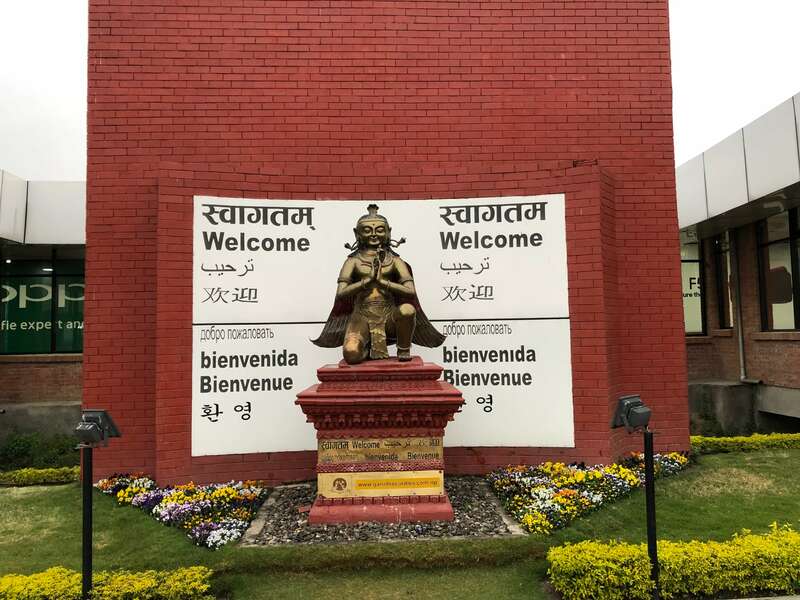 So, when you arrive at the very small Kathmandu airport, you need to get a visa. There is no need to do it ahead of time unless you want to. Here is the link to the procedure. For us to get a 90 day visa (the longest possible), it was $100 cash. Don’t forget to bring cash. It is not required to pay in Nepalese currency, and they accept many foreign currencies. When you arrive, the quickest option is to grab a paper form and fill it out and attach a copy of a passport photo. You’ll want to bring many extra copies of passport photos to Nepal. I have a dozen as they seem to randomly be needed for things and we will need so many permits that I don’t know if they will want them for each one. So, bring the form and the photo up to the visa desk, pay the fee, and then go through the final customs check. The problem we had was that Griggs’s extra photos were in his pack that they took. It all happened so fast, he didn’t think to dig them out of the pack. So, we had to wait in line at a kiosk for him to get a photo. That took almost an hour. Alternately, you can use the link I gave above and just print out the form and attach a passport photo ahead of time if you really want to fly through the whole process. Ok, next up was getting our bags. After the kiosk ordeal, our bags were some of the last ones there and amazingly untouched, whew! Just after the baggage claim, you’ll walk out towards the transportation. It really wasn’t as crazy as I imagined, but maybe we hit a slow period. It was more hectic with people pestering me with scams when I arrived at the airport to visit Puerto Vallarta many years ago. I think it’s just about managing expectations. I was pleasantly surprised. Right before we exited, there were desks for SIM cards. We want to just get it done, so we took the time to do that. The two main options are Ncell And Telecom. We heard Ncell was best for actual data service, so we went with that. You will need another passport photo for the form and your passport and visa to show. It was a quick process, but it can be done almost anywhere in Kathmandu if you want to wait. It’s too exhausting to give things in foreign currency, so I’ll just quote USD for things. It was just $18 for the SIM card, 10GB of data (good for a month), and 80mins international calling. It’s just $15 more for another 10GB. There are cheaper options if you want just 5GB or less, but that’s so cheap we took it! There’s even an Ncell app for adding more data and they had a deal of unlimited data for an hour for just 75 cents. It actually worked too! Too bad I won’t have much opportunity to use all the data available to me out here. Immediately, I had great service and was texting home like I never left. It was dark and raining when we left the airport. 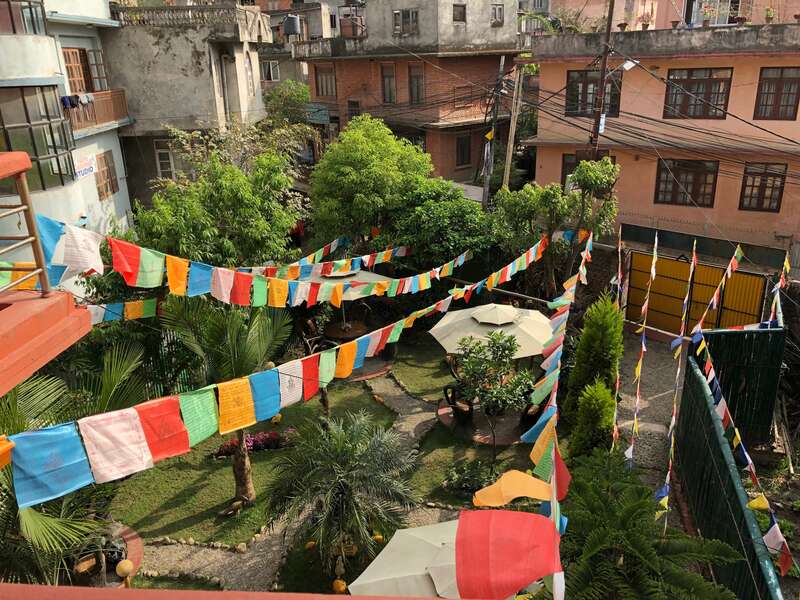 We chose a personal taxi of a $10 flat fee to get to our hostel in Thamel, the tourist district of Kathmandu. For little stuff like that, we don’t feel a need to haggle price and felt that was totally fair. It should have taken 25mins, but it took about an hour because traffic was at a standstill. There were no stoplights; I’d liken it to being a pedestrian in downtown Chicago midday just weaving between the people…except there were cars and mopeds instead of people in suits. There were no rules. Just squeeze in where you can. It was just $10 for an hour long ride. In the US, with a meter running, that would have been horrendous! 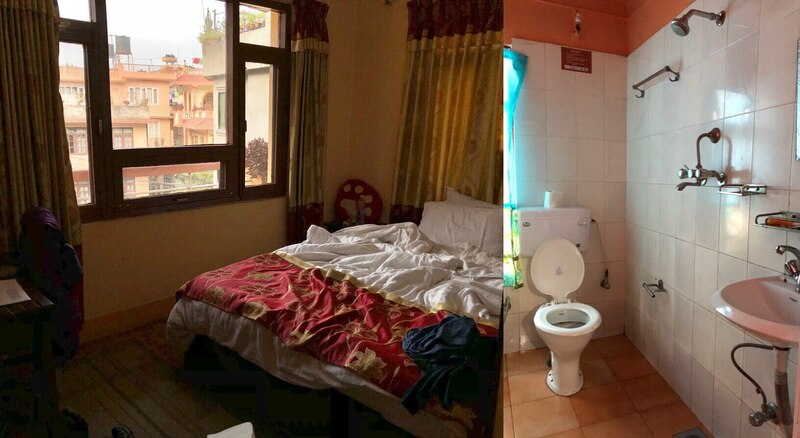 We arrived at the Elbrus House Hostel in Thamel (Kathmandu’s tourist district) at 7:30pm, two hours after landing an hour late circling the airport due to poor visibility. This isn’t the fanciest, but it has breakfast provided, is quiet, spacious rooms, cute courtyard, and awesome balcony views. Internet was to be expected and my shower wasn’t the warmest, but amazing for just ~$16-$18/night! Notice the shower sink and toilet all in one space. Looking down on the courtyard from my balcony. Meeting our agent Urja from Alliance Adventures. Ok, back to Urja. 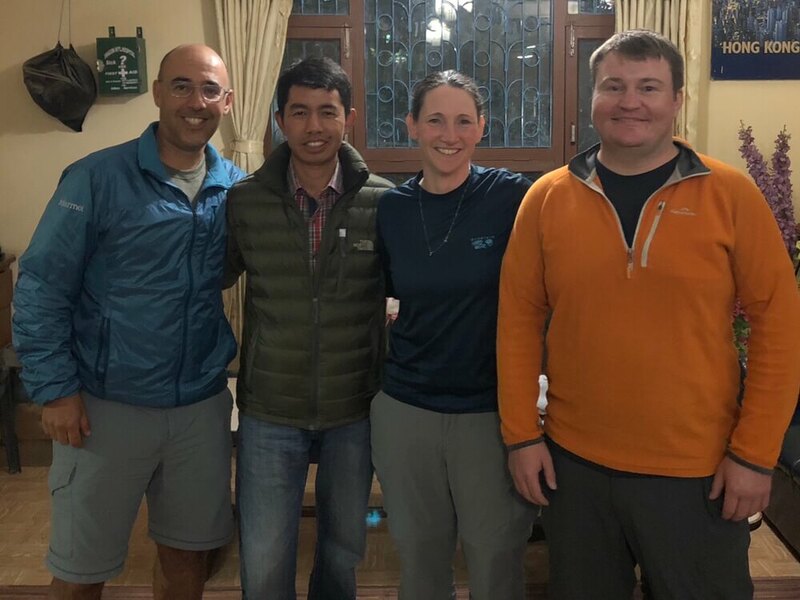 Most GHT hikers are in Kathmandu up to a week before starting the trek due to all the permits and logistics. I feel like each group gets a bit more efficient with the resources being handed down. Buck-30 delved into every blog and documented GHT trip out there, weeding through which ones matched our planned modified high route. I’m SO THANKFUL he took the lead on this. I took the lead on communicating with Urja via email and then What’sApp messaging and calls. We didn’t know if it would be worth the back and forth and time put in. We have been warned the Nepalese will aim to please and that they will promise the moon and the stars, but often, cannot follow through. Urja told us he could have our permits ready within 24hrs of our arrival. We were hopeful, but realistically thought maybe a couple days…he had our permits handed to us and our required guide (by permit) for the first section ready for us just 19hrs after we arrived! A miracle!!! THANK YOU Urja!!! I’m telling you, if you’re planning either a mostly unguided (like us) or guided trek, USE URJA and ALLIANCE ADVENTURE. Also, he understands what kind of miles and pacing thru-hikers want. It’s completely different than most tourists hiking the common treks. Urja knows what GHTers are doing and what permits are needed. In all honesty, nothing will be perfect. There are some things lost in translation, but we are happy to support a native Nepalese agent and that feels right. We were warned this is a high season for trekking and many of the guides willing to do what we are requesting (no porter, carry some food, carry a tent to be independent of tea houses) can be tough to book last minute not knowing our exact schedule. Our guide Kishor does not speak English, and is in a tight window to help us out before he has to be back to guide another trip. Meeting our guide Kishor (in green). We may even pick up another guide the last couple days if Kishor has to head out, and we aren’t able to hit our ideal schedule and pace. 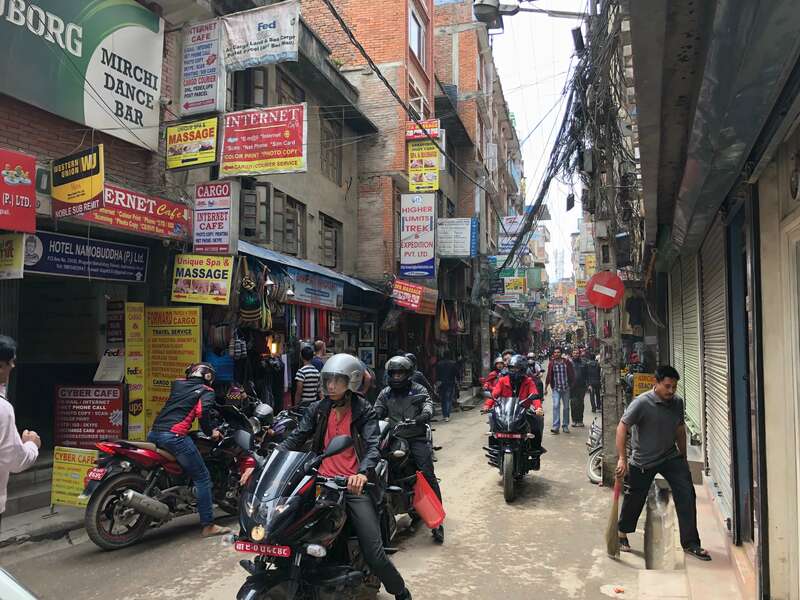 New required permits for the first couple weeks in the Kanchenjunga region require a guide for multiple manned checkpoints. I’ll go over pricing later. We won’t use porters and will need a guide required by permit maybe two more times I think for short stretches. The guide isn’t because of difficulty of the trek, it’s just a permit thing and it does bring more money into Nepal. Doing this trip honestly and following the required permits and guide rules can be pricey, but we just don’t feel right trying to beat the system (some hikers do sneak through checkpoints) of a country where really our dollar is worth so much and can bring more to a country that has been through a lot of challenges the last handful of years. We are finding a good balance with it and are happy to think of this as a once in a lifetime experience worth paying for. On a side note, many want to know my impressions of being here in Kathmandu. I actually came in expecting much more of a shock. Yes the roads are crazy with people walking with no sidewalks and motorcycles and cars just zooming everywhere and honking and dogs barking everywhere. The dust that is kicked up and smog was not fun. You really just had to treat the cars and motorcycles as large people bustling about and just weave your way through. We’ve been eating burgers and sandwiches and such. Nothing Nepalese yet. We will have tons of that over the coming months and are fattening up while we can. We did not have time to do much out on our day with adjusting to being here and preparing everything. We will do more at the end and will be back in Kathmandu. For now we have a weather window to try to get this hike in. Time for being tourists later. 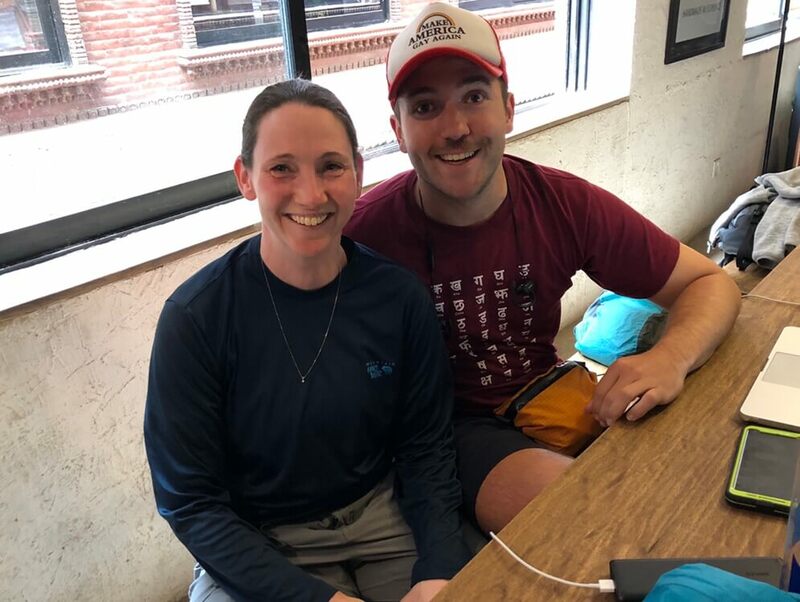 We did visit for a few hours with Another hiker that is here in the city that I have known online and Griggs met in person last year on the CDT. Mac has a well known blog, Halfway Anywhere, and was very helpful for us when we did Tasmania last year, as he had just been there before us. It’s such a unique world. It was the crossing of two blogospheres! Spending time with Mac of Halfway Anywhere. Along the lines of guiding companies, there is an American company run by a hiking friend of mine that I can recommend. If you would like more of a supported GHT experience, and have the funds, Seth Wolpin and Himalayan Adventure Labs. would be great. Seth and his friends did almost a complete high route of the GHT in 2014 hitting the major mountaineering passes we will go low on. They are badass for sure! 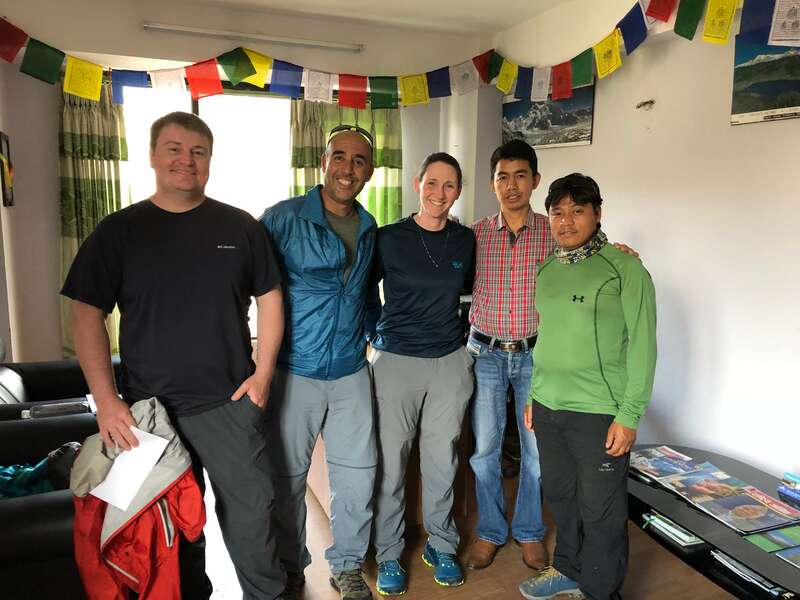 Check out Seth’s GHT links on his Himalayan Adventure Labs site. He has a detailed interactive map, links to resources, and even an extensive database of previous hikers that have given a strong effort. It’s tough to explain, but the GHT has taken on a looser interpretation than the trail creator, Robin Boustead (here is his site) intended. It’s gotten well out of hand with what people are claiming are GHT completions. I won’t get into it, but it is an increasingly heated conversation within the thru-hiking community, what the definition of a thru-hike is. I just can’t even have the conversation. Just know that we are doing what is called a “modified high route” attempt of the GHT. We will do our best to stay as high as we can within our ability level and to connect our footsteps across Nepal. Really, there is no one out there who can claim to have fully completed the entire high route Robin has written about. Just beware when researching the GHT that there are many interpretations, and finding the beta that matches the route you would like to do, can be very challenging to weed out unless you really sit down with a map and realize what people are saying is the GHT. Just beware of that. Having said that, we want to thank the people whose routes and experiences we have found helpful. Robin, Seth, Remy (a personal thru-hiker acquaintance), Pepper and Trauma, Doc, and Trevor. I know many of these names may not ring a bell, but they are on Seth’s database and you can find some links to their beta there. I also want to thank Kathleen who hiked with Seth and spoke personally to me as a woman who hiked the GHT. There was also the trio from Belgium and Norway who did a modified high route of the GHT (skipping some at times for various reasons). Their route doesn’t overlap with much of what we are doing, but their documentation and photos really helped me to visualize doing this trip. Thank you to Eef, PJ, and Marylene for your documentation of your route and for your correspondence with us. As for pricing, it ain’t cheap. I’m very happy that the three of us have a common understanding about budgets and ethics/morals. I don’t know. There’s just something that makes me uneasy about haggling and trying to beat the system in a third world country. Why not contribute to the economy of such a special place that could really use the money. Anyway, here’s what we’ve paid for the guide, agent fee, and permits thus far. This will be about the first ~40% of the trail. We will do the rest when we return to Kathmandu in a month or so. Here is what we each paid generally so far to give an idea of this trip. We each are carrying $1000 in Nepalese currency that only has an equivalent of a $10 bill as their largest bill…so I’m carrying 100 individual bills (worth $10 each). There’s one more thing to add to the base pack weight. We have heard how it’s better to be safe and carry plenty of cash than to have to hitch out and get cash for something. In addition to what’s listed below, we will pay at tea houses and at some of the police conservation checkpoints. Griggs and I each got one way flights here from the US (returning elsewhere TBD): $500-$550. Buck-30 got a round trip for $700. Whew, ok, I think that’s it. Again, you may not see a post for a few weeks or a month, but that is to be expected. Notice we will start by going north to Kanchenjunga Base Camp to technically hit the eastern terminus of Robin’s GHT route. Some do not do this, as we then will hike back south the way we came to then start heading west across Nepal. As thru-hikers, we just really want to have that feeling of going almost fully border to border if we can. Also, it’s a nice way to acclimate with tea houses along the way. It will be an interesting balance as we will take off with a week of food, in our packs and balance that with tea houses. We can’t bring stoves these first few weeks because we cannot bring fuel on the flight and there is nowhere to buy it. That will be interesting and we will be just reheating dry things with water and not cooking and we are not eating at a teahouse. We would like to be independent of the tea houses, but know we will likely stay or eat in them at least half the time on this stretch. It’s just part of the experience. Ok, here we go!! I’ll be in touch in a few weeks or a month! I’ve heard that sometimes the inReach may randomly not send a signal. Don’t worry if something happens and you don’t see points on my map for some reason. I don’t expect that to happen, but know we all have PLBs and ways of getting help if needed. We are safe and extremely prepared! Woaha! How do you write all of that and make it looks so easy. It will take me days to write 1/2 of that. Glad to hear all is going well so far. And love your spirit about not haggling. Well, there is something to be said about your kind heart. Don’t haggle with poor chaiwallas (tea vendors), but suggest haggling away in the major cities at the established storefronts. :). Have fun, be safe and sound. Best of luck! It will be fun to follow you here and I look forward to hearing your talks on this when you get home! Dang, way too much info for me, you could just write a book. Stay safe out Wired!!! Most fitting trailname..
You could just hike the PNT in your spare time..
Nepal was my first not-in-Europe/USA visited country and a great choice, I´ll never forget how nice, friendly and helpful the people were and your pictures of Kathmandu bring back great memories. I never got sick eating in teahouses, only was careful with water. You are tough, you´ll be fine. Stay safe and have a great trip can’t wait to see more of this adventure! The wait will be worth it! Tried to post a comment on Buck 90s blog, but no dice.. I do look forward to learning more about him from this trip. His first entries are quite informative. Ps. When you are done, read the book “walking the Himalayas” by Levison Wood. He also has a documentary I think of the same name. I think you’d enjoy it! Anna, thanks for pointing out the hat! It’s awesome hey Lynn? I want one! Wow, this IS really the most adventurous of your treks so far. Have so much fun!! Hi, Yodella-hee-hoo. Have fun on your trip. Will be watching for pics. Just read all of your prep posts now that your a few weeks in. I now have a better understanding of everything. All of your are awesome in so many ways. Hope this trail is all that you want. What an experience! Wishing you all health, adventure, learning, and enjoyment along the way. Get Walking With Wired Delivered To Your Inbox!